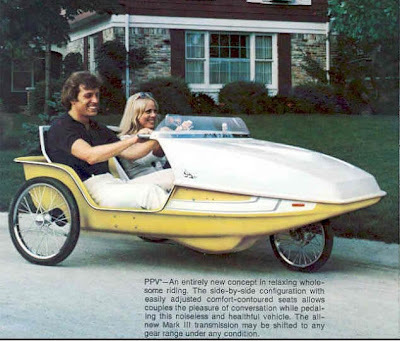 Found a 1973 PPV "Velomobile" and got it going. These PPV's which stands for People Powered Vehicle are extremely rare. This one was made in 1973. I simply had to have it when I found it. After about 6 hours of work repairing it from it's decades of storage I actually took it out for an enjoyable 5 mile ride on the Local Bike Trail. 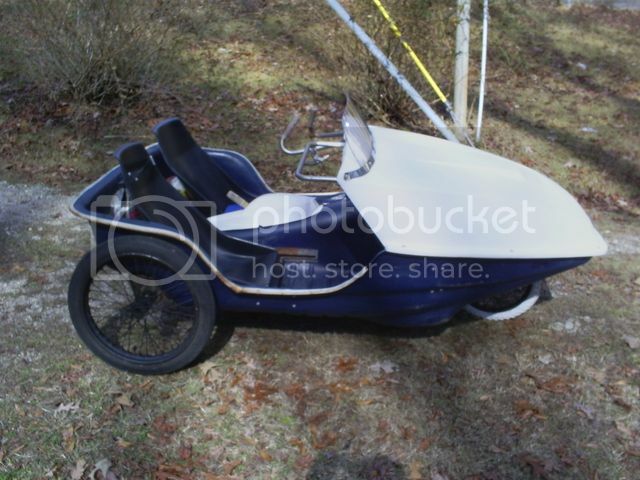 Today it would be called a Velomobile. 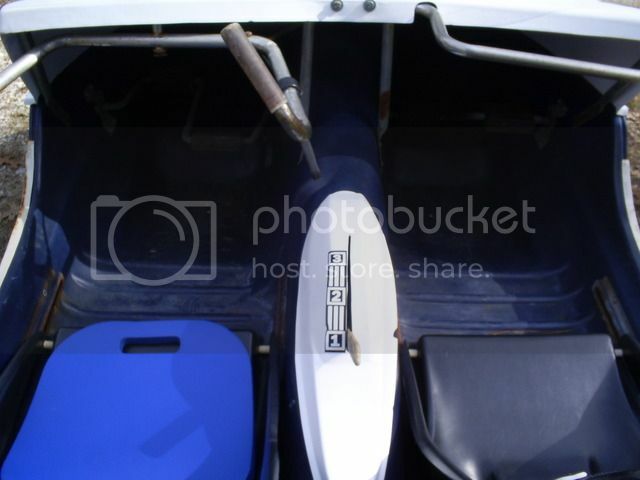 It can seat two adults and both can independently pedal it as both sets of peddles have ratcheting Freewheels. It also has a three speed transmission that can be shifted at any time under all conditions. If you end up stopping with it in third gear you can simply pull the shift lever back into first gear to get it going again or if you need to shift to first gear while climbing a hill you can do that while straining at the pedals. Riding it was a hoot. Here's a few pictures. Nice score! I remember seeing one of those when I was a kid growing up, which would have been the early 70's. Looks like it was well taken care of. I "Drove" it to McDonald's this morning for breakfast. 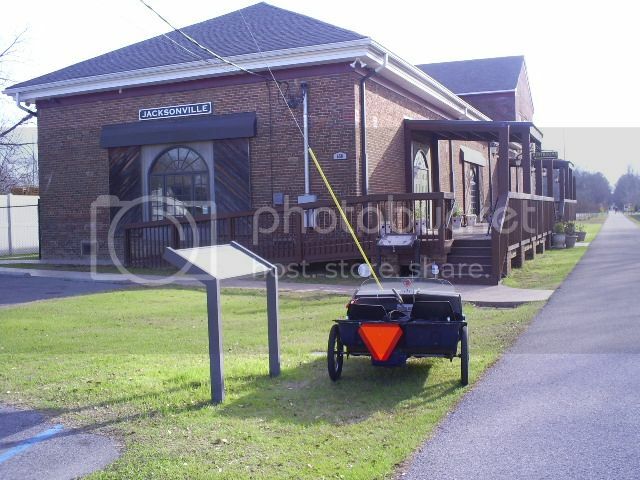 This involved riding it about a 1/2 mile on a road shared with motor vehicles. It's considered a Bicycle so that's perfectly legal. On the way back home a Policeman pulled me over. He wanted to check and make sure it was indeed a Bicycle and not some sort of Go cart or Golf cart that are not street legal. He thought it was the neatest thing he had ever seen. He took a couple of pictures of it and said he would post them so other Police Officers would know what it is and not not pull me over again. I ended up giving every kid in McDonald's a ride in it in the parking lot while parents or grandparents took pictures or videos. People were also waving and smiling at me as I rode it home like I was in a Parade or something. This contraption is a ton of fun! How cool is that. I want one! Well, I broke it yesterday. There are 18 tooth single speed freewheels connected to the pedals. This allows independent peddling by both people. The most used one on the left side broke. 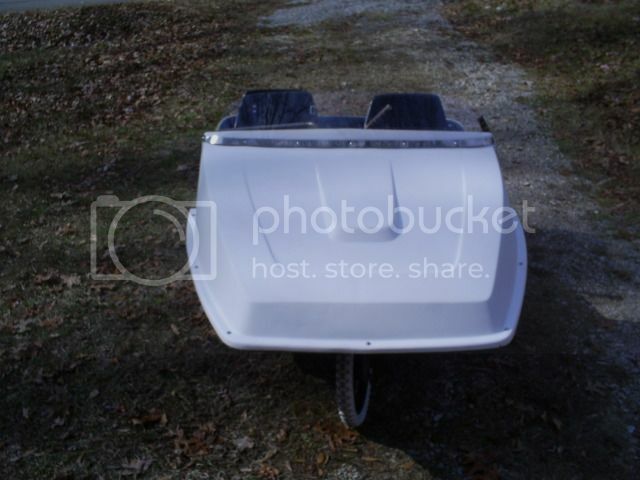 Lucky for me I was able to get it home by sitting and peddling from the right side and steer it with my left hand. It was actually easy to do that. I ordered two new freewheels for a little less than $10. I should have it going again in a couple of weeks when my new freewheels arrive. These freewheels screw into the rear wheel hub on single speed bicycles. On my PPV those freewheels are tack welded on steel tubing. I already have tubing that size and aluminium bar stock to make new bushings for the pedal shafts. It's actually an easy fix for me. I have a metal lathe and vertical mill and I also weld.
. . . 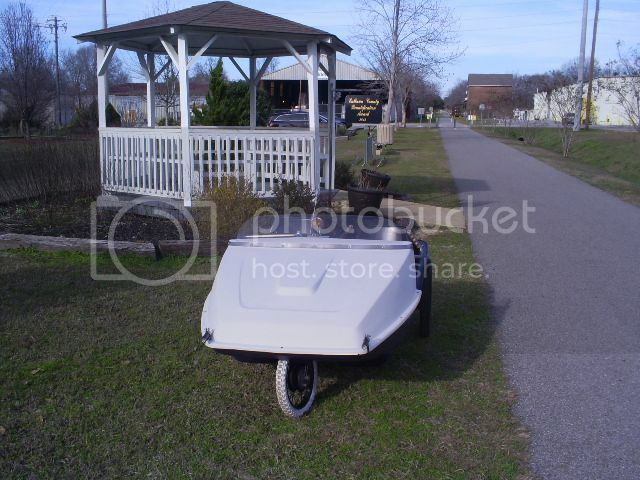 I was able to get it home by sitting and peddling from the right side and steer it with my left hand. I did get an odd feeling "Driving" it from the right side but I never felt like I needed to "Drive" on the left side of the road. Those original freewheels have "Made in England" imprinted on them. I'm sure they were supplied by that company already welded to the tubing with that bushing pressed in. I can understand why the Brits do that. I've never been able to remove one of those freewheels from a hub using those two little spanner holes that are there for that purpose. I even have that special spanner wrench for removing them. After a few years those freewheels are impossible to remove without destroying them in the process. What I always end up doing is welding a large nut to the freewheel and use an impact wrench to unscrew it from the hub. I've been repairing bicycles since I was 12 years old. I've found those welded on tubing freewheel setup's on many adult trikes. The thread size in those freewheels is 1 3/8" X 24 TPI. Standard tubing will just slide inside those threads. Most people will simply drop the tubing in the hole and tack weld it. The tubing will invariably be off centre a little but it's "close enough" in most instances. I'm a perfectionist so what I do is knurl the tubing, which makes the diameter of the tubing a little larger. It's just enough to become a press fit inside the threads so when it's tack welded the tubing remains perfectly aligned in the freewheel. 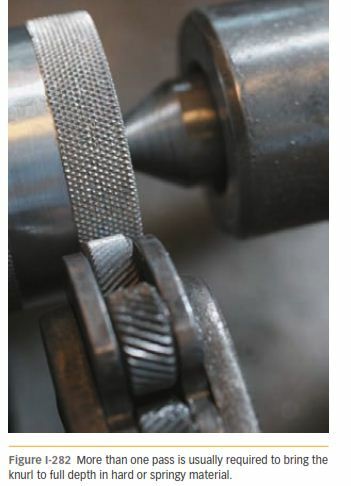 Knurling is usually applied to metal so it greatly improves the ability to grip the bar with a human hand. Below is a picture of a part that is in the process of being knurled. Now you have a chance to change the gearing! I did change the gearing while I had it apart for repairs. It came with a 37 tooth sprocket attached to the pedal shaft flange, which is called a chain ring in bicycle technical terms. I had a 30 tooth sprocket I "Liberated" from a kids bike I found in a pile of trash waiting for pickup by the City's trash service. I drilled matching holes in it and bolted it in place where the 37 tooth sprocket was. I've found the gearing much better for climbing the hills in my neighbourhood and on a route I take when I go shopping in it at a Wal-Mart about 5 miles from my home. 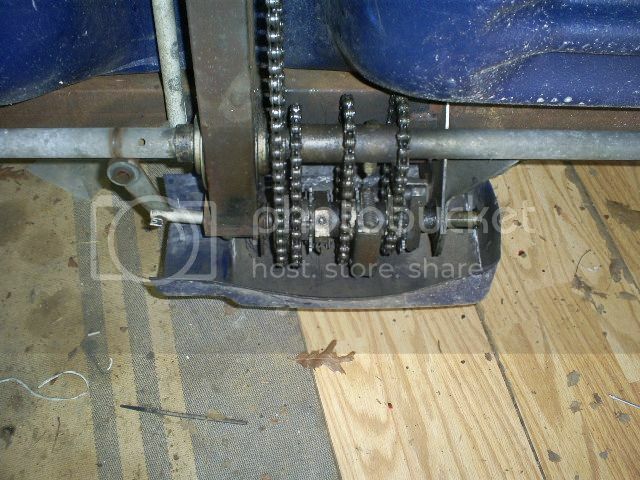 That 7 tooth difference made my first gear a granny gear and second gear where first gear was. Third gear is now usable on level roads where it was only useful on down hill runs before. I'm seriously considering placing a 3 speed hub in the chain line between the chain ring and the transmission input shaft. This would give me 6 gears instead of the 3 I have now. The reason I want to do that is I still have two hills with 18 percent grades where I must get out and push it up those two hills. Having that 3 speed hub in line would give me a double low gear which would allow me to climb those two hills with ease. Also running double high with the hub in 3rd gear and transmission in 3rd gear would give me back that downhill "overdrive" gear again. 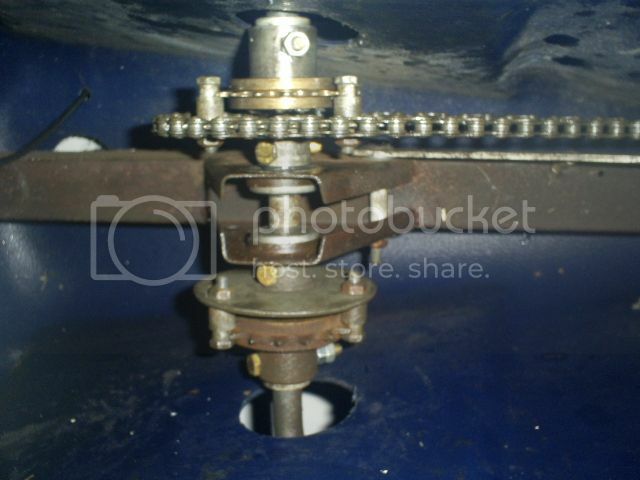 In the picture below a 3 speed hub is shown in the drive line for a 3 speed adult trike. Typically those 3 speed hubs are located in the rear wheel of a bicycle. A sprocket is welded or bolted to one of the spoke flanges on the hub. I have repaired it and even took it out for a test ride with the new free wheel on the left side pedals. I am happy with the 30 tooth chain ring that replaced the stock 37 tooth chain ring as well. Here's a picture of the bottom bracket assembly with the new free wheel and 30 tooth chain ring installed. 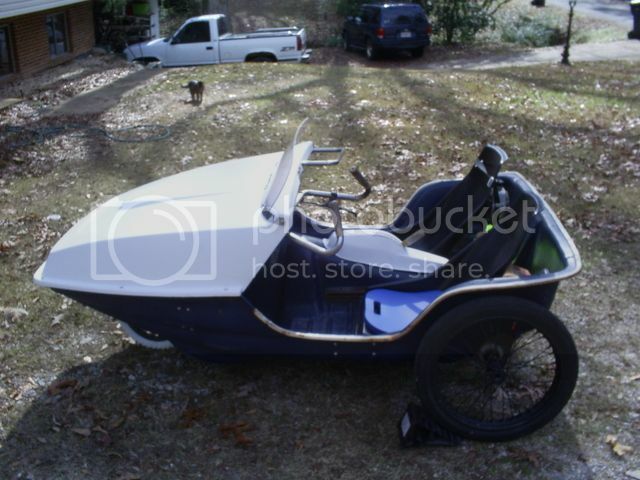 Here's a couple pictures from my test ride with the repairs completed. I greatly improved the PPV over the last week. I purchased an old bicycle at a yard sale for a couple of bucks that had a 3 speed internally geared hub. I checked the hub for proper operation and found it worked perfectly. I then cut the old rusty spokes and steel rim off it. I welded a 16 tooth sprocket to the hub so it would become a 3 speed jack shaft between the pedal sprocket and the sprocket on the 3 speed transmission on the rear axle. I fabricated a mounting bracket that clamps to the frame so no permanent modification was done just in case the hub fails later so I can easily return it to the original configuration. I took it out for a short 6 mile test ride and found it improved it very much! There are a couple of hills that were so steep I had to get out and push it up as first gear was simply not low enough to pull them. Now with the hub in first gear and the transmission in first gear (double low) I can easily pull both of them. Also with the change from a 37 tooth to 30 tooth pedal sprocket when I installed the new ratchets on the pedals I lost about 5 mph on the top end. In double high I got that 5 mph back, which improved my average speed. Other gear combinations provide much better pedal cadence rpm for for road conditions. The jump between the gear ratios with just the 3 speed transmission were simply too much. Where 3rd gear was too high 2nd gear was too low, but I had to live with the slower speed. Now I can run with the hub in 3rd gear and the transmission in 2nd so the ratio for climbing that grade is now perfect. 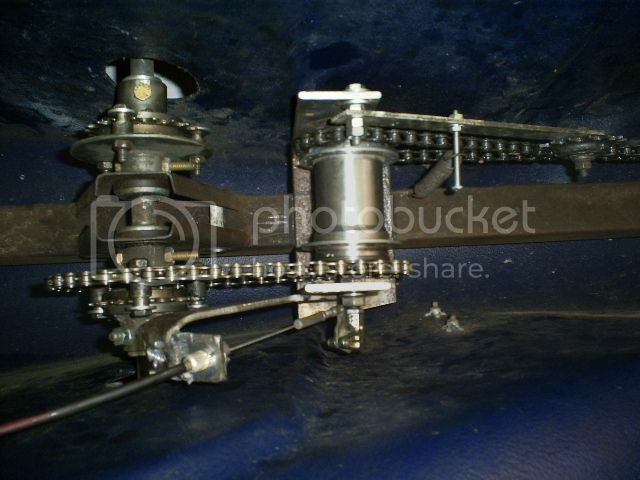 Here is a picture of the pedal and hub setup and the transmission.